Learning lesson: part of the Gronstedt ‘Train for Success Group’s tour. It’s very easy to be wise with hindsight. That is not to take anything away from the outstanding performance of Otago Polytech tutor and SLENZ Project’s lead educator (Midwifery) Sarah Stewart’s (SL: Petal Stransky) before what she admits now was an unexpectedly large crowd of “experts” for her early morning (NZ time) presentation and tour of the project’s birthing unit on the SLENZ Project island of Kowhai last week. Your’s truely, also admits he was a little unprepared as a “helper” being “invited” to demonstrate his “incompetence” (grin) in the early New Zealand morning after a self-inflicted heavy night of Second Life roleplaying. Stewart also must be forgiven for her late notice of the Gronstedt ‘Train for Success Group’s tour, because it had been moved up a week on short notice, following the postponement of another planned presentation. 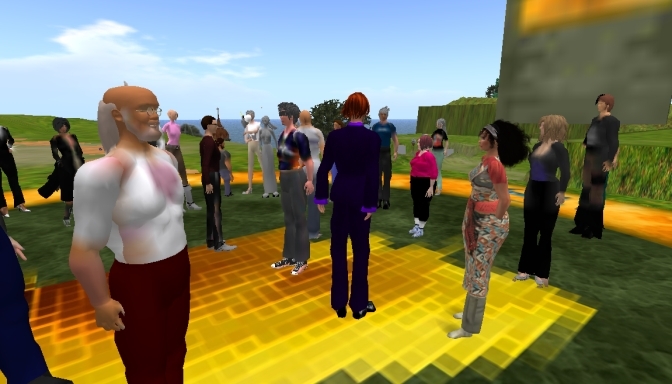 It did not help that Stewart understandably did not realise the group’s importance – in an education sense in the world of Second Life – until a few hours before the meeting, and that she had previously only presented “virtually” to very small groups. The debriefing at the normal Monday SLENZ team meeting, however, raised some other important points – albeit many probably not new – which may be useful to others presenting their projects to tour groups, particularly those composed of virtual world aficionados. One must qualify “tour parties” before presentations so that one has an understanding of who they are and what their needs and desires are. At least two people are normally needed for a successful presentation of this nature – on voice and monitoring chat, and in an IM link between presenter and helper. The helper/facilitator should have enough knowledge of the project and the site to be able to answer questions, in text chat if necessary, rather than interrupting the flow of the presenter. It would help if the helper is given a copy of the briefing paper before the event. The TP area or meetup/holding area where the major voice briefing is being held should be far enough away from the unit to be toured to prevent contention between voice – the tour leader presenting and the helper answering questions – when the audience is split into smaller groups to tour a facility. If there is a potential for conflict the helper should only answer questions in text chat. If there are two or more parties being shown the facility at the same time, all tour leader briefing should be done in text chat. If there is contention this can cause problems for video/audio recording and is distracting for the presenter. In facilities where the tour has to be conducted in “tight spaces” the roof should be able to be lifted off the facility so all the tour members can cam in, especially if they cannot fit inside the space without difficulty. The SLENZ birthing unit has this facility but neither the presenter nor the helper knew how to activate it. On tight sites, with the audience split into a number of tour groups it is also potentially worthwhile having the ability to rez a duplicate facility (if the prims are available) so that simultaneous tours out of voice range of each other can take place. There is a need for an agreed presentation format which both the presenter and the helper/faciliator are able to refer to during the presentation as well as succinct presentation briefing notecards the audience can pick up from a notecard-giver on the site and which the presenter alerts them to. If the presentation is to be in voice rather than text the presenter or helper must ask everyone to use headsets or to turn off their talk button because of feedback echo problems from both that and from the use of computer speakers. The presenter should also use a headset for voice. The presenter and the helper involved in the presentation should check voice levels immediately before the event and also make sure they are linked in a private IM window … so they can text to each other privately during the presentation if necessary. (Practice with this in presentation mode might be necessary so that the presenter is not distracted by the text). The helper should IM anyone generating echo and ask them politely to turn off their talk button. The helper must have both sim knowledge and sim land rights to ensure he or she can deal with griefers – this tour attracted one – and other sim problems which might arise, without disturbing the presenter. The SLENZ Project’s Birthing Unit – Te Wahi Whanau – has been given a great introduction with the release on April 30 of a a video which explains simply and cogently why and how the pilot midwifery project has evolved. The first public showing of the video was scheduled to take place at the Open University in Delhi, where it was to be presented by joint SLENZ Project leader, Terry Neal (SL: Tere Tinkel). The lead educator for the pilot is Sarah Stewart (SL: Petal Stransky). The video, originally conceived and pushed by SLENZ learning designer Leigh Blackall (pictured below right, SL: Leroy Post), was produced by Blackall (audio recording and editing) and SLENZ lead developer, Aaron Griffiths (pictured above right, SL: Isa Goodman) (video images and editing). Blackall is currently working on a comic to go with the video as part of the introduction to the Otago Polytechnic project. The midwifery pilot on Kowhai is one of three pilots being worked on by the SLENZ Project which has been funded by the Tertiary Education Commission of New Zealand. The project has been designed to determine how multi-user virtual environments (MUVEs) might benefit New Zealand education and how this can best be done. 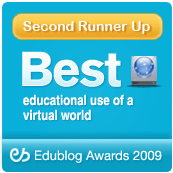 Using the multi-user virtual environment Second Life, it aims to delineate and demonstrate to New Zealand educators and students the educational strengths or otherwise of learning in a virtual world.